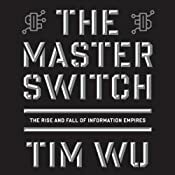 Written by Tim Wu and narrated by Marc Vietor “The Master Switch” is about the past and present of the United States communication industries. I bought this audio book from Audible.com. The information contained in this book is wonderful and enlightening. I learned a lot about the history of the telephone, movies, radio and the Internet. I am keeping this review really short to contrast how terribly long and drawn out this book is. I would estimate that half of the words in the book are unnecessary and do nothing but make the book longer and harder to read. I found it very boring and frustrating because of this. But the information you walk away with if you make it through the book is really great stuff. A secret history of the industrial wars behind the rise and fall of the 20th century’s great information empires – Hollywood, the broadcast networks, and AT&T – asking one big question: Could history repeat itself, with one giant entity taking control of American information? Most consider the Internet Age to be a moment of unprecedented freedom in communications and culture. But as Tim Wu shows, each major new medium, from telephone to cable, arrived on a similar wave of idealistic optimism only to become, eventually, the object of industrial consolidation profoundly affecting how Americans communicate. Every once-free and open technology was in time centralized and closed, a huge corporate power taking control of the master switch. Today, as a similar struggle looms over the Internet, increasingly the pipeline of all other media, the stakes have never been higher. To be decided: who gets heard, and what kind of country we live in. Part industrial exposé, part meditation on the nature of freedom of expression, part battle cry to save the Internet’s best features, The Master Switch brings to light a crucial drama rife with indelible characters and stories, heretofore played out over decades in the shadows of our national life. If you do not currently believe that Net Neutrality laws should be passed immediately I beg you to read this book. I rate this book a 6 out of 10 because of how wordy it is, cut it in half and it would be a 10.